Browning’s weapons are long-lasting, primarily because we respect the philosophy of John M. Browning, the brilliant inventor of the B25. According to him, the hands of a gunsmith are always more precise than a machine, however sophisticated it may be. That’s why all our over-and-under shotguns have hand fitted action frames! Each gun is individually adjusted and filed; there is no automation at this stage. The manual process of fitting the action frame guarantees an optimal distribution of the recoil forces that can cause breakage. So, we can say that every Browning shotgun is unique. Proof of this? – The parts are not interchangeable. 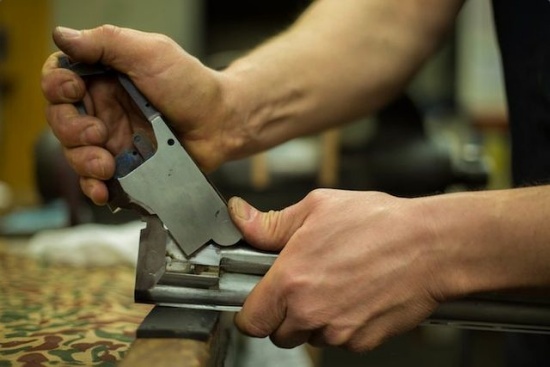 So confident are we in the robustness of our shotguns, we are the only manufacturers to offer a 10-year warranty on our action frames as standard. Japan is where we make our over-and-under shotguns, a place held in great esteem by connoisseurs of fine knives. The reason is the exceptional steel from which they make their famous katanas. Our Japanese suppliers deliver one of the highest quality hot forged steels in the world. This allows us to manufacture our metal parts to uncompromising standards. We know that the devil is in the detail. That’s why we leave nothing to chance! For example, our guns have bolts three times larger than those of our competitors. This maintains the barrels better when fired, and prevents play appearing which could eventually damage the whole gun. Another example is that barrel locking lugs are housed on a hinge pin, whereas most manufacturers operate with trunnions. The bearing surface of our shotguns is therefore considerably increased, which greatly reduces vibration in the barrel. Most suppliers of wood for gun-making think we’re the most demanding manufacturer in the market. Browning insists on not only the most beautiful but also the highest quality wood. The slightest defect means we reject the whole batch. We are also proud to be one of the only manufacturers to fit all woods by hand! Because the ranges are perfect, recoil and vibration are less likely to damage the wood. We are also the only manufacturers to include ‘bedding’ on all our under-and-over guns. 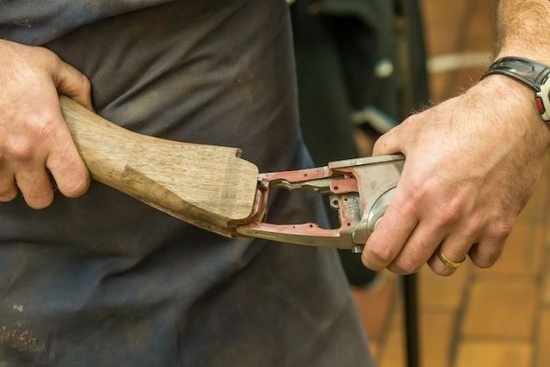 This term refers to a technique of putting a kind of glue between the action frame and the stock which protects the wood as the gun is fired. So, if you want a shotgun that will stand the test of time, go to www.browning.eu! Reconditioned my 1953 “D” grade O/U last year. Now looks as new. Cost per year to own $14-29 $ Aust No idea just how many shots have been fired through it since I bought it in 1966. Used on a weekly basis until 2000 still take it out regularly. I love brownings they are easy to fix ultra reliable ,and they shoot good to .I would say they are best there is. I have a new 525 & it’s perfect in every way—–I simply love it.